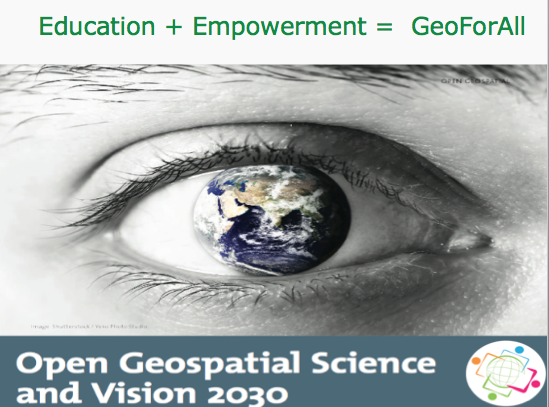 It is over a decade now since we started working on the philosophy of Openness in Geospatial Science and Education ,,. Please find below the pledge for supporting Open Principles for Science and Education for building a better world for everyone . “I believe Science is a public good and quality education opportunities should be open and accessible for everyone. I will work to eliminate the digital divide and contribute to building up Open Knowledge for the benefit of all humanity, with special effort to enlighten future generations. I contribute my service for the betterment of all humanity using the guiding principles of the United Nations 2030 Agenda for Sustainable Development in building a better world for everyone. I will work to advance and increase Open Knowledge for the benefit of all humanity with special consideration of those less fortunate.